There is enough salty-sweet sauce for both brushing and dipping smoky grilled drumsticks. If you’ve got a crowd, add some bone-in chicken thighs to the grill and use all the sauce as a barbecue glaze. Heat grill to medium-high heat. Mix chili sauce, soy, honey, and sesame oil in small bowl; reserve half of sauce to serve with cooked chicken. Season chicken with salt and pepper. Place chicken on grill; cover. Cook about 25 minutes, turning once or twice, until no longer pink near bone. Begin brushing remaining sauce on chicken during last 15 minutes of grilling. Serve chicken sprinkled with onions and reserved sauce. 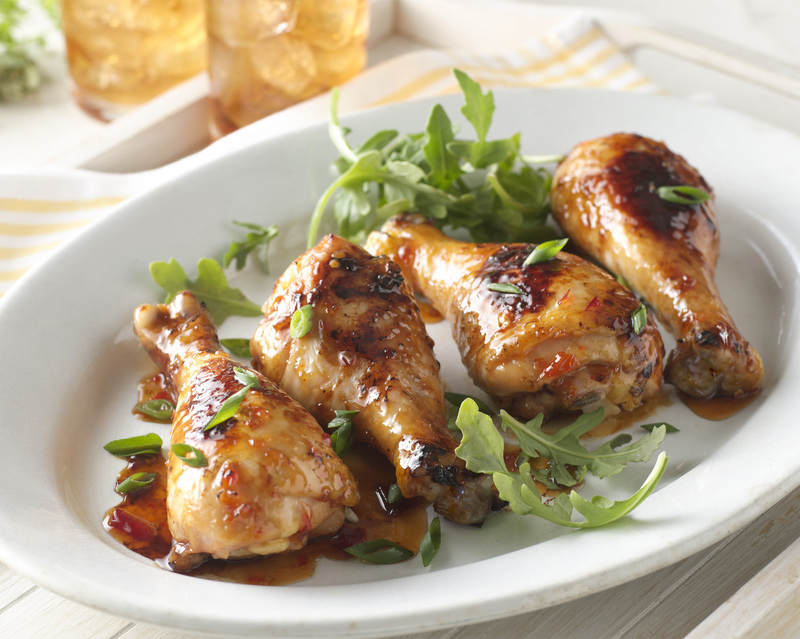 Gold’n Plump® Bone-in Chicken Thighs may be substituted for Gold’n Plump® Chicken Drumsticks.